Henri J. Bertini was born in London in 1798 and died in Meylan (near Grenoble) in 1876. His brother, a pupil of Clementi, gave him his first piano lessons and he very quickly became a recognised virtuoso. On April 20th 1828 he performed his own transcription of Beethoven’s Seventh Symphony for eight hands with Franz Liszt (the other two pianists being Sowinsky and Schunke). His position as an important virtuoso was therefore clearly evident at that time. In one of his letters Hector Berlioz professed himself to be a great admirer of Henri Bertini and that his music “made his heart beat fast”. What a compliment! 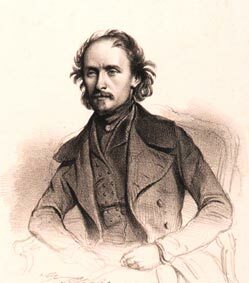 Bertini later returned the favour, dedicating his last sextet to the French composer. Even though Franz Liszt and Frédéric Chopin have left us an unmatched legacy in terms of piano études, we must not forget those other lesser masters that worked in the same field with talent, if not genius; here I am thinking of Ignaz Moscheles, Giuseppe Concone, Stephen Heller and Johann Nepomuk Hummel, to name but a few. That said, Bertini strikes me as being of a higher order; his études are perfectly written for the instrument and almost all have that personal touch, demonstrating a vivid imagination as well as a certain charm that has always intrigued me. They are a pleasure to play, even if some of them are rather difficult technically speaking. Bertini’s études are perfect gems of conciseness, very "utilitarian" but still, nevertheless, highly musical. This should not surprise us : Bertini was also an undisputed master in chamber music. When, we may ask, will we hear recordings of his six sextets with piano and double bass that are fine examples of this genre ? As far as I know, only the third sextet has been recorded by the Sestetto Classico. Henri Bertini also wrote a four-hand transcription of Bach’s "Well-Tempered Clavier", though this is of no particular interest (Théodore Dubois has also produced his own version). Bertini’s complete études are hard to come by these days. Given the quality of this music we can only hope that a new critical version may one day be published. There is no doubt that such an edition would be of great interest to all those who love the piano. The classification of Bertini’s études is problematic : not all bear opus numbers and some sets are grouped in various “cahiers” that are either numbered in sequence or starting afresh each time. In addition, some cahiers bear letters instead of numbers. We have letter L, letter K, but no letter A ! As an example of the confusion that reigns, in the old Lemoine edition the 4th cahier is designated as opus 134, the 5th has no opus number and the 6th is designated as opus 66 ; furthermore, opus 178 has been assigned letter F whereas 122 bears letter G ! Another odd example is opus 134 that serves as the introduction to opus 66. All in all it is very difficult to find one’s way with such contradictory references. Even worse is the fact that some of Bertini’s scores are not in France’s Bibliothèque Nationale ! For those of you that may be interested, a book on this composer has recently been published as part of the collection entitled "Portraits de Meylan". The author of this work is Pascal Beyls, and he has kindly allowed me to consult scores that up to now have been unobtainable. I would like to thank (without undue flattery) Editions Delatour for having allowed me to rescue these études from obscurity.